Talk of a political solution in Syria is mounting by the day, not only among those directly concerned, such as Russia, Iran and Special Envoy Lakhdar Brahimi, but in opposition circles as well. The opposition includes the “Onshore” Coordination Committee and the “Offshore” National Coalition and National Council. Likewise, the regime, which is striving at all levels to show a fair amount of internal cohesion and its ability to prevail militarily. Leaks to Hezbollah’s mouthpiece al-Akhbar about the “First Lady” being pregnant, and President Bashar al-Assad being assertive about the successes of his army and his ability to come out on top, are simply attempts to expedite the solution. Russia is arguably scurrying for a solution for fear of military setbacks it does not preclude and risk precipitating a loss of control. Russia is absolutely convinced the regime can’t possibly prevail by military might and the longer the fighting drags out, the lower the chances of a face-saving settlement. Prime Minister Dmitry Medvedev’s recent remarks set the tone of Moscow’s occasional concerns, which dissipate once Sergei Lavrov, the hawk of Russia’s Syria policy, resumes talking tough. Iran in turn seems in a rush. It aspires to do a deal with Washington inclusive of sanctions, its nuclear program and the Syria file in the few months left on the countdown clock to its June presidential elections, the most sensitive since the 1979 Khomeini revolution, according to Ali Akbar Velayati. The leadership of Iran’s conservative camp believes the Syria situation and recent reversals in Iraq will have their say in the looming presidential ballot. The rationale is that the Iranian street will hold the conservative leadership accountable for failure of its regional project, which cost it an arm and a leg – not to mention the debilitating sanctions caused by its unconvincing nuclear ambitions. Outside the realm of its narrow sectarian politics, Tehran is undoubtedly concerned about the political burden caused by the Syria file on its links with the Arab and Islamic worlds. But instead of teaching Tehran a lesson, such a “concern” sees it escape forward without avoiding pitfalls, as against Mohamed Morsi in Egypt’s case. This explains why Iran leaders don’t stop talking of a political solution in Syria, entreating the Syrian opposition (specifically the National Coalition) to a dialogue and leaking ceaseless news of their huddles with Coordination Committee representatives. The U.S. and the West’s veto on a political solution seems to have evaporated too, particularly that the destruction (of Syria) demanded by Israeli Prime Minister Binyamin Netanyahu has peaked, raising the specter of chemical weapons and long-range ground and ground-to-air missiles. Netanyahu expressed his worries by ordering Israel’s latest airstrike. The raid, which Bashar said targeted a scientific research center, was apparently a chemical weapons storage site the Israelis feared might fall into rebel hands. Proof is that the army communiqué hinted at the failure of “terrorists” to seize it, despite trying. The other account is that the airstrike was against a convoy ferrying ground-to-air missile to Hezbollah in Lebanon. The American line is that the bombed site was home to chemicals as well as long-range ground-to-ground and ground-to-air missiles. Also shaping the West’s stance is the rise of the Jihadists’ clout on the Syria scene. This is a cause of concern for the West after the attack on Algeria’s Amenas gas plant, France’s intervention in Mali, the earlier outrage in Benghazi, and the uncertainties of the Syria endgame. In short, the West does not want to see the fighting go on to the point where Jihadists effectively rule the roost in Syria. The regime is aware of this. And so are the Russians and the Iranians, who are now blowing out of proportion the Jihadist factor. Iran’s ambassador to Iraq, for instance, went on record claiming Jabhat al-Nusra members now make up 70 percent of rebel fighters in Syria. Additionally, Bashar – as reported by al-Akhbar – suggested the U.S. “is not ready” for a solution yet, implying that the key to one remains in his and his allies’ hands. Weighing most on the shoulders of the regime and its allies is unquestionably the economic factor. Bashar’s coffers are quickly running dry and his treasury risks going bankrupt under the burdens of battle estimated by Western sources at $1 billion a month. Correspondingly, the Syrian opposition feels the weight of the world on its shoulders due to: (1) The magnitude of the human suffering (2) Devastation of the country and its economy (3) The financial and military embargo clamped on the revolution. The opposition’s biggest handicap is its failure to forge a single policy opinion – one that fuses together the initiative of Moaz al-Khatib and the Coordination Committee views endorsing Lakhdar Brahimi’s plan without a mention of Bashar. Moaz al-Khatib has now offered talks with regime representatives outside Syria, subject to the release of 160,000 detainees and the renewal of all expired passports held by members of the Syrian diaspora. And to regain the trust of the National Coalition and National Council, he later explained that his conditional offer was to begin talks for the regime’s departure. 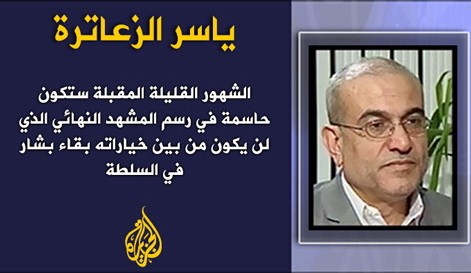 The regime cannot possibly accept Moaz al-Khatib’s offer because it would be effectively acknowledging defeat. A crucial problem relates to the side that can impose a settlement on the warring camps. Bashar addressed this point indirectly in the leaks to al-Akhbar, saying if Turkey simply cut supply lines to the rebels, he could bring the “insurgency” to its knees inside two weeks – a sign of his arrogance and political blindness. So what can the regime or its Russian and Iranian mainstays offer the opposition after its breakthrough with U.S. Vice President Joe Biden? And what trade-off would they propose to the U.S., knowing that the opposition won’t submit to any Washington diktat? The outcome of the ongoing “political ping-pong” is hard to predict. Surely though, prolongation of the battle will not only lead to more victims and ruin, but also make Bashar and his inner circles’ survival chances unimaginable. Even if the battle lasted a few more years, the regime will fall. Turkey for one, plus the revolution’s Arab backers, will not accept defeat by the regime and Iran. One pointer is Turkish Foreign Minister Ahmet Davutoglu’s whistle-stop visit to Qatar at the tail end of January. Together with Saudi Arabia, Turkey and Qatar get full play in the opposition camp. Even assuming the political ping-pong led to a “Great Bargain” involving the Russians, the Americans and Iran, none of them can dictate anything to the rebels. Plainly, any solution that keeps Assad in office can only mean the revolution’s defeat. That’s one thing Turkey specifically will not accept. Turkey cannot bear defeat by Iran, period. Therein the good tidings lie before the opposition: the prospects of qualitative arms from Turkey, Qatar and Saudi Arabia – plus the possibility of Jordan turning a blind eye to the smuggling of arms into Syria. Once that happens, the situation on the ground would shift in favor of the revolution, possibly allowing it to concentrate on the battle for Damascus while popular protests continue almost everywhere else. The implication is that military muscle would put political travails in the shade and eventually bring down the regime. The assumption is opposition leaders would by then have figured the endgame after consulting the revolution’s backers and shutting out U.S. wiles. In short, the next few months will be decisive in shaping the final scene leaving out Assad, even if Russia – and more so Iran – kept digging in their heels. Labels: al-Akhbar, Bashar al-Assad, Damascus, Hezbollah, Iran, Israel, Moaz al-Khatib, National Coalition, National Council, Qatar, Russia, Saudi Arabia, Syria, Syrian opposition, Turkey, U.S.